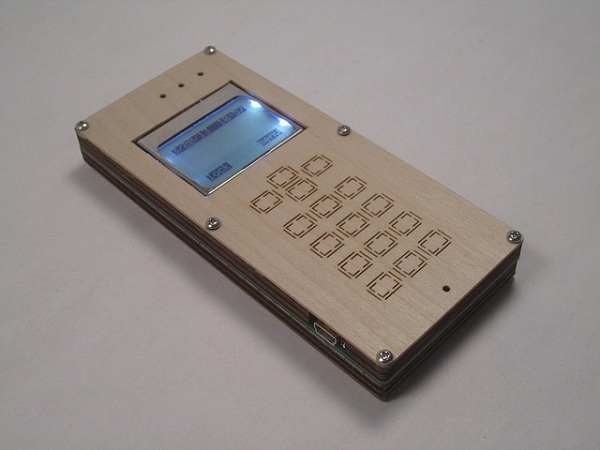 Here is a DIY cellphone based on the Arduino platform and the GSM shield. It features basic functionality of a cellphone including making calls, sending SMS, storing phone numbers and displaying the current time. The DIY Cellphone is a working (albeit basic) cellphone that you can make yourself. It can make and receive phone calls and text messages, store names and phone numbers, and display the time. It builds on the hardware and software in the Arduino GSM Shield but extends it with a full interface, including display, buttons, speaker, microphone, etc. This entry was posted on Wednesday, August 14th, 2013 at 7:00 pm	and is filed under Arduino, DIY. You can follow any responses to this entry through the RSS 2.0 feed. You can skip to the end and leave a response. Pinging is currently not allowed. Cool, opensource is about 20 years behind Samsung. very cool. the ability to make a phone for a grandparent that does nothing more than make and receive calls and has no other functionality whatsoever is priceless…. Err, this is not an Open Source Cellphone, this is an Open Source controller to a closed-source cellphone module. There is, I believe, an Open GSM stack out there, and I would dearly love to see someone implement an entirely open phone (especially because, y’know, Prism and all that…) but this is not that. What use is an open phone that uses a goverment controlled network? @bolke, Perhaps an open cell phone can be used with the likes of Open-infrastructure outside the “Government” controlled network”? Google “OpenBTS” for a start, then move on to the likes of Asterisk etc. soft-switch stuff. Maybe OpenBTS in conjunction with evolving low-cost SDR options will come to light (if not already). But then again, the Government typically controls the RF spectrum. But Governments have been known to fall. It’s good to have a back-up option, just in my opinion.